I wish I could say jumping off a sailboat speeding through the Atlantic was all part of the plan, but that would just be a lie. 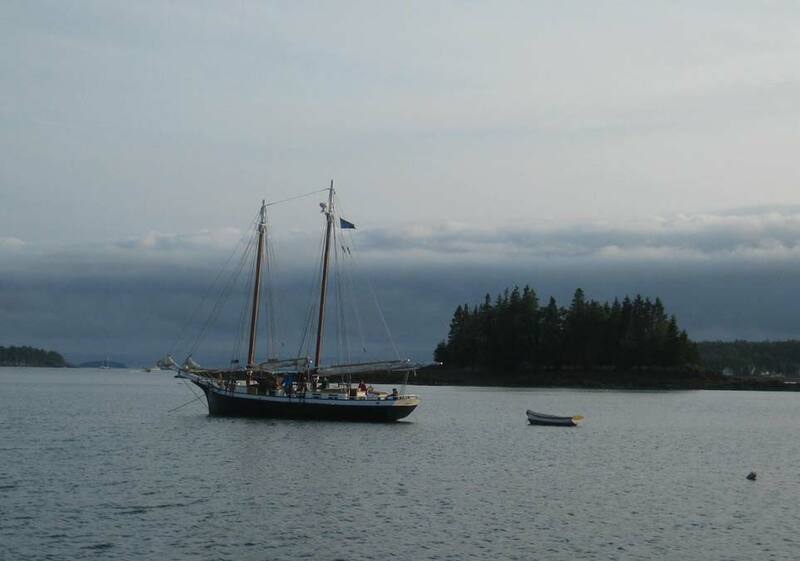 Yet it wasn’t exactly out of the norm, either, since I was a deckhand on a Maine windjammer, one of the massive wooden boats that port in the harbours of coastal Maine and stride its horizons like jewels on a sunlit crown. The windjammers, which run day- or even weeklong cruises for paying passengers, are many things to many people. A historian might consider these ships—many of which date back to the 19th century, if not earlier—a vital link to the nation’s industrial-boom roots, preserved specimens of the Industrial Age’s answer to the tractor trailer. The citizens of Camden, Maine, consider them a keystone of the town—in no small part thanks to the thousands of dollars they bring in each season. And due to their short season, comparably modest pay and exceedingly high turnover rate, to the sailors who work on them, the windjammers act as one hell of a crucible. Fresh out of college in 2014 and riding an on-campus IT job until the summer’s end, I felt pulled toward unusual work, a job that would hit me with something new every day. A friend of a friend pointed at sailing as a gig that fit the bill. “You’ll be tested physically, emotionally, and mentally,” he wrote me, adding that Maine was the way to go for those without experience. A quick search led me to Captain Ray Williamson. Owner and operator of the Grace Bailey, he told me in no uncertain terms that the living was tight, the days were long and, coming on mid-season, the best he could offer me was an unpaid position in the kitchen on the Bailey’s sister ship, the Mercantile. “You can live on a boat, see the coast!” shouted the romantic in me. “Free food!” roared my stomach, which hadn’t quite graduated college with the rest of me. “I can be there on the third,” I told Captain Ray, and started packing. What can I say? Free food is a powerful motivator. 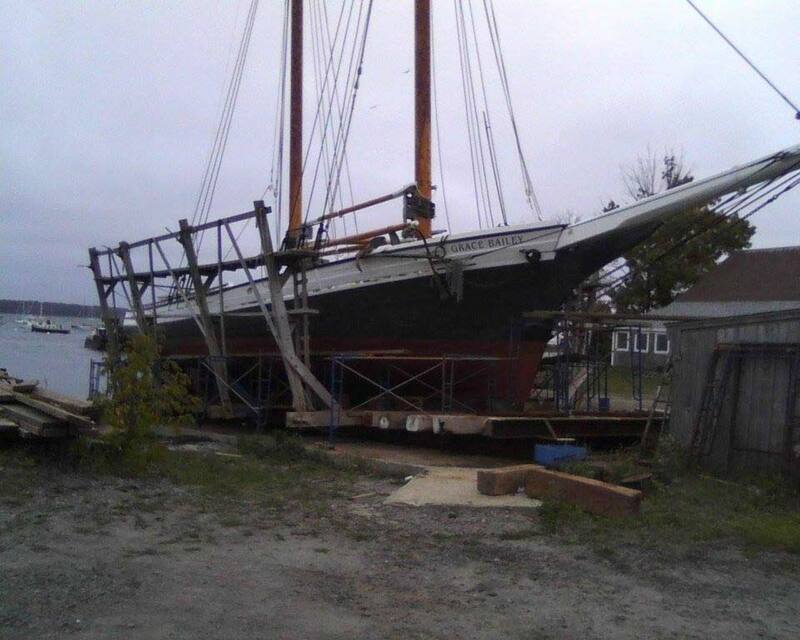 The windjammer Grace Bailey, dry docked in Maine. I spent the first 27 days on the water, stopping in port only to resupply and take on new passengers. Some moments and sensations I remember particularly well: scrubbing away at a mountain of dishes with no water pressure and the last clean sponge on the ship, feeling the saltwater sting at my fresh, unformed callouses; standing on the aftmost section of the boom, trying to tuck down a sail as the mounting winds slapped it into my face over and over; vomiting into a trashcan as I wrestled with my first and last bout of seasickness; and, most vividly, lying back at the end of the night and staring into the Milky Way for the first time in my life, my body flush and exhausted from weeks of hard work. At the end of August, I knelt on the galley floor, scrubbing away to clean it before the next voyage, when Captain Ray made his way inside. “Can you pass a drug test?” he asked. Captain Ray was not one for small talk. In a daze, I shook his offered hand, elated to be on the payroll but contemplating how I knew absolutely nothing about sailing. Over the next month, my mental state oscillated daily between sheer terror and complete exhilaration. 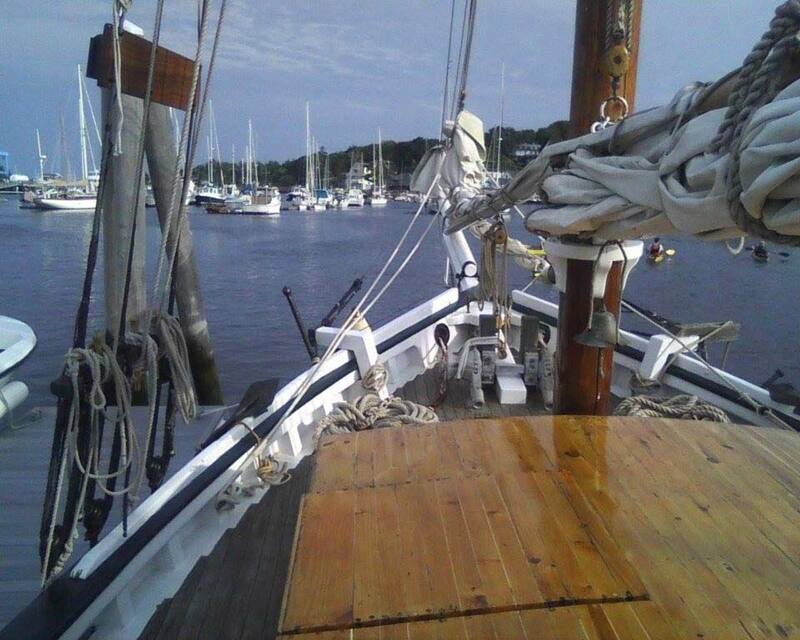 I learned to tie the knot that I would use to secure myself to the top of the mast for repair work, some 50 feet above the gently rocking deck. I learned the 15-minute process of winching up the 300-pound anchor by hand. And, on one of the more exciting days, I learned how to catch a mooring. Being constantly surrounded by the serene beauty of coastal Maine helps ease the blow of not getting paid for working full-time. A mooring is the nautical equivalent of a parking space. In the waters outside port towns float dozens or even hundreds of pennants—floating buoys with eight-foot sticks waiting for a sailor’s sure hand to snag and pull them aboard. Attached to these pennants are ropes as thick as a man’s forearm, secured firmly to colossal slabs of granite sunk to the bay floor decades earlier. Once deckhands wrestle them aboard, they shackle these mammoth ropes to the distinctive red hook of a shorter, thicker rope already aboard the ship. Once the two ropes are connected, the ship pulls to a stop: an anchor, made to order. Sometimes, however, like in the town of Castine, Maine, whoever made the pennant neglects to include the eight-foot stick. The buoy sat a mere foot off the surface of the water, and somebody had to climb down and grab it. I lost a brief, tense game of rock-paper-scissors with the other deckhand and swung myself off the side of the deck, placing my feet carefully as I navigated down the swaying net of chains and ropes. I settled myself at the lowest spot possible, one hand holding our ship’s rope by its large red hook, the rest of my limbs clutching the chain like a misplaced sloth. The spray had already drenched me through, and I shivered in the shadow of the great hull. A minute passed, and suddenly the iron shackle of the buoy appeared off to my right, bobbing erratically up out of the waves. I leaned out to loop the hook. To miss this, I reflected, would leave us drifting hard toward the land. Best-case scenario, we would drop 120 feet of anchor chain and spend half an hour the next morning hauling it up. Worst case? 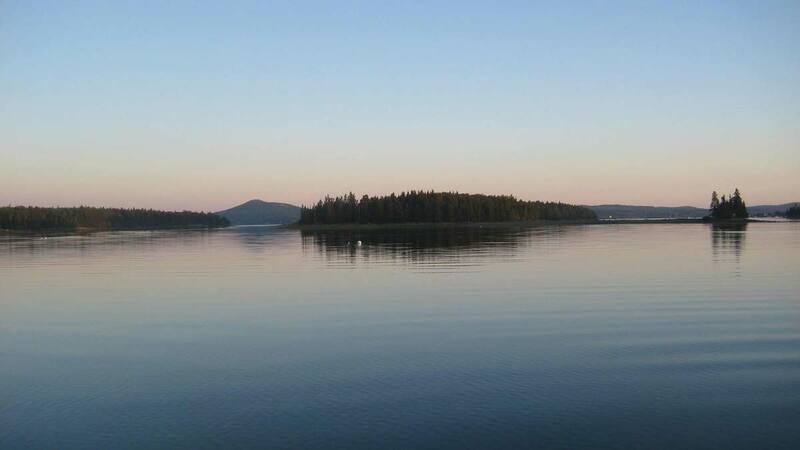 We could violently become a fixture of the Castine dock. So you’ll understand my concern when the buoy started to drift past, scant feet out of my reach. The bow of a Maine windjammer: You wouldn’t want to climb down over its edge. I needed more reach. I let go with my legs, feeling momentum swing me in every direction as I clutched the ship’s chain with one hand. “Hell with it,” I thought, and swung my body hard toward the buoy, letting go entirely. I hung in the air for what felt like a minute before landing on the tiny rubber surface. I steadied myself, clipped the hook on and managed to re-grip the ship’s chain before I tumbled into the frigid water. Seconds later, the rope went taut, pulling a hundred-ton ship to a sudden stop. I heard only creaking wood and dark, sloshing water. With a deep breath, I grabbed onto the rope with my other hand and started to climb back to the deck. Like I said, this wasn’t exactly out of the norm. But for a job that promises low pay, long hours and a battered body, you could do much worse. Sam Rapine is happy to report that he made it off of the ship without falling in for good. He currently works as a firefighter and EMT in the Philadelphia area while keeping his ear to the ground for the next adventure.​ If you're considering working on a windjammer, he recommends the classifieds at Crewbay or Crew Seekers, and particularly the infamous Picton Castle, as great places to start.